Note: For 2018, the men's race was shortened to two days. The first stage, planned to be a short "Sprint Challenge" was cancelled because of lack of interest from the teams. There is a men's race on the 21st and a women's race on the 22nd. Also, the race has been moved to the week between Milano-San Remo and Gent-Wevelgem instead of the following week, before the Tour of Flanders. The race: here's the report from winner Elia Viviani's Quick-Step team. 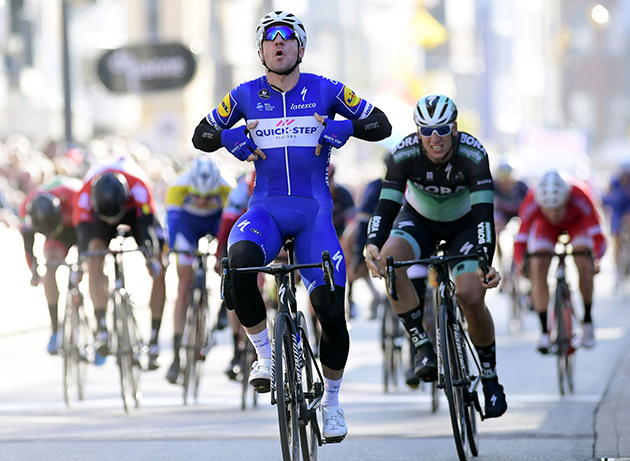 Despite the race format being changed, Driedaagse Brugge – De Panne continued to attract many important names at the start for the 42nd edition, which began from the Grote Markt, where the Ronde van Vlaanderen used to start between 1998 and 2016. The 202.4km-long course packed five climbs, including the infamous Kemmelberg, and three cobbled sectors, all of which featured in the first half of the race. A breakaway comprising six men – Sean Bennett (Hagens Berman Axeon), David Boucher (Tarteletto-Isorex), Conor Dunne (Aqua Blue Sport), Tanner Putt (UnitedHealthcare), Ylber Safer (Tarteletto-Isorex) and Brian van Goethem (Roompot) – formed soon after the start and built a nine-minute advantage, which prompted a response from Quick-Step Floors, who sent Dwars door West-Vlaanderen winner Rémi Cavagna at the front of the peloton to control the leaders' gap. No splits occurred in the field on the hilly section of the race, but the status quo eventually changed with 66 kilometers to go, as several teams decided to lift the pace in the crosswinds, hoping they will catch some favourites off-guard. Elia Viviani, together with two Quick-Step Floors teammates, made the cut, but a lack of collaboration allowed the chasing group to make the catch, just before entering on the first of the two laps around De Panne. Ten kilometers from the finish, the pack was down to 50 riders and the escapees close to being reeled in, when a sudden acceleration blew the race apart and left around 15 riders at the front, including three of Quick-Step Floors. 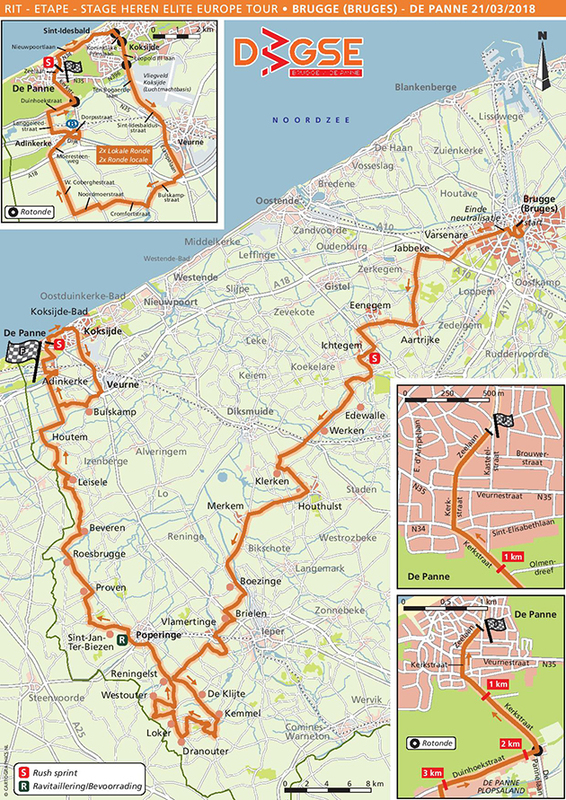 Eventually, the race came back together in De Panne, where Florian Sénéchal and Maximiliano Richeze controlled the peloton and brought Elia Viviani to the front going into the final bend. 2 Ackermann, Pascal Bora-hansgrohe s.t. 3 Philipsen, Jasper Hagens Berman Axeon s.t. 4 Planckaert, Baptiste Katusha-Alpecin s.t. 5 Debusschere, Jens Lotto-Soudal s.t. 6 Capiot, Amaury Sport Vlaanderen-Baloise s.t. 7 Jans, Roy Cibel-Cebon s.t. 8 Hofstetter, Hugo Cofidis s.t. 9 Blythe, Adam Aqua Blue Sport s.t. 10 Grosu, Eduard Nippo-Vini Fantini s.t. 11 Dupont, Timothy Wanty-Groupe Gobert s.t. 12 Vermeltfoort, Coen Roompot-Nederlandse Loterij s.t. 13 Mannaerts, Jelle Tarteletto-Isorex s.t. 14 Mezgec, Luka Mitchelton-Scott s.t. 15 Waeytens, Zico Veranda's Willems-Crelan s.t. 16 Richeze, Maximiliano Quick-Step Floors s.t. 17 Franczak, Paweł CCC Sprandi Polkowice s.t. 18 Coquard, Bryan Vital Concept s.t. 19 Turgis, Jimmy Cofidis s.t. 21 Biermans, Jenthe Katusha-Alpecin s.t. 22 Fenn, Andrew Aqua Blue Sport s.t. 23 Jensen, August Israel Cycling Academy s.t. 24 McCabe, Travis UnitedHealthcare s.t. 25 Dehaes, Kenny WB-Aqua Protect-Veranclassic s.t. 26 Kuznetsov, Vyatcheslav Katusha-Alpecin s.t. 27 Perry, Benjamin Israel Cycling Academy s.t. 28 Vanspeybrouck, Pieter Wanty-Groupe Gobert s.t. 29 Kolář, Michal Bora-hansgrohe s.t. 30 Van Keirsbulck, Guillaume Wanty-Groupe Gobert s.t. 31 Warlop, Jordi Sport Vlaanderen-Baloise s.t. 32 Petit, Adrien Direct Energie s.t. 33 Maes, Nikolas Lotto-Soudal s.t. 34 McNally, Mark Wanty-Groupe Gobert s.t. 36 Aert, Wout van Veranda's Willems-Crelan s.t. 37 Sénéchal, Florian Quick-Step Floors s.t. 42 Sisr, František CCC Sprandi Polkowice s.t. 44 Menten, Milan Sport Vlaanderen-Baloise s.t. 45 Oliveira, Rui Hagens Berman Axeon s.t. 46 Noppe, Christophe Sport Vlaanderen-Baloise s.t. 47 Boucher, David Tarteletto-Isorex s.t. 48 Pichot, Alexandre Direct Energie s.t. 50 Goethem, Brian van Roompot-Nederlandse Loterij s.t. 51 Hofland, Moreno Lotto-Soudal s.t. 52 Martinelli, Davide Quick-Step Floors s.t. 53 Vantomme, Maxime WB-Aqua Protect-Veranclassic s.t. 56 Dunne, Conor Aqua Blue Sport s.t. 64 Rice, Michael Hagens Berman Axeon s.t. 65 Cavagna, Rémi Quick-Step Floors s.t. 66 Trusov, Nikolay Gazprom-RusVelo s.t. 67 Coenen, Dennis Cibel-Cebon s.t. 68 Stevens, Timothy Cibel-Cebon s.t. 69 Vanbilsen, Kenneth Cofidis s.t. 70 Garrison, Ian Hagens Berman Axeon s.t. 71 Mertz, Rémy Lotto-Soudal s.t. 72 Cima, Damiano Nippo-Vini Fantini s.t. 73 Frison, Frederik Lotto-Soudal s.t. 75 Van Genechten, Jonas Vital Concept s.t. 76 Durbridge, Luke Mitchelton-Scott s.t. 77 Van Hecke, Preben Sport Vlaanderen-Baloise s.t. 78 De Backer, Bert Vital Concept s.t. 79 Schip, Jan-Willem van Roompot-Nederlandse Loterij s.t. 84 Gène, Yohann Direct Energie s.t. 85 Planckaert, Edward Sport Vlaanderen-Baloise s.t. 87 Antonini, Simone Wanty-Groupe Gobert s.t. 88 Riesebeek, Oscar Roompot-Nederlandse Loterij s.t. 90 Shilov, Sergey Gazprom-RusVelo s.t. 91 Vallée, Boris Wanty-Groupe Gobert s.t. 92 De Rooze, Niels Tarteletto-Isorex s.t. 93 De Bock, Stijn Cibel-Cebon s.t. 94 Soupe, Geoffrey Cofidis s.t. 95 Koning, Peter Aqua Blue Sport s.t. 96 Cima, Imerio Nippo-Vini Fantini s.t. 97 Sagiv, Guy Israel Cycling Academy s.t. 98 Duquennoy, Jimmy WB-Aqua Protect-Veranclassic s.t. 99 Ariesen, Tim Roompot-Nederlandse Loterij s.t. 100 Ruijgh, Rob Tarteletto-Isorex s.t. 101 Masson, Christophe WB-Aqua Protect-Veranclassic s.t. 102 Małecki, Kamil CCC Sprandi Polkowice s.t. 103 Hepburn, Michael Mitchelton-Scott s.t. 107 Lagutin, Sergey Gazprom-RusVelo s.t. 108 Leysen, Senne Veranda's Willems-Crelan s.t. 109 Keukeleire, Jens Lotto-Soudal s.t. 110 Haller, Marco Katusha-Alpecin s.t. 111 Boivin, Guillaume Israel Cycling Academy s.t. 112 Dieleman, Michiel Cibel-Cebon s.t. 113 Kozonchuk, Dmitry Gazprom-RusVelo s.t. 114 Shalunov, Evgeny Gazprom-RusVelo s.t. 115 Sellier, Simon Direct Energie s.t. 116 Cardis, Romain Direct Energie s.t. 117 Mathis, Marco Katusha-Alpecin s.t. 118 Cataford, Alex UnitedHealthcare s.t. 119 Almeida, João Hagens Berman Axeon s.t. 120 Winden, Dennis van Israel Cycling Academy s.t. 121 Steels, Stijn Veranda's Willems-Crelan s.t. 122 Oliveira, Ivo Hagens Berman Axeon s.t. 123 Van Breussegem, Elias Veranda's Willems-Crelan s.t. 127 Hatsuyama, Sho Nippo-Vini Fantini s.t. 128 Pluciński, Leszek CCC Sprandi Polkowice s.t. 129 Teugels, Lennert Cibel-Cebon s.t. 130 Maikin, Roman Gazprom-RusVelo s.t. 131 Yechzkel, Aviv Israel Cycling Academy s.t.